Simplicity, minimalism and living simply have been on trend for some time now. Many of us are over worked, over stressed, feeling we have too little time and too much stuff. We are seeking something else. We are seeking something simpler. 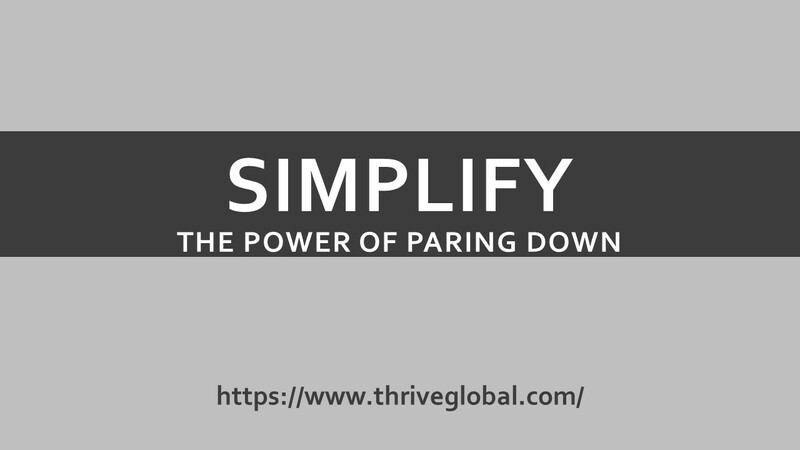 Reduced to its core, simplicity is about us identifying the truly important areas in our lives and doing our level best to remove any distractions. We identify the essential and eliminate the non-essentials. We reduce the clutter and turn the volume down on the noise. We prioritise our time. We decide on what, and who, it is that is most important to us in life and shape our focus and energies around these areas. By definition, these priorities must be on a short list. The shorter, the better in fact. We can’t and shouldn’t be chasing every bright, new, shiny light. It’s not sustainable. Uncovering our priorities in life is a great first step but then we need to align our behaviour and lifestyle with what we uncover. This is a distinct step all of its own and where the magic really happens. We pare down. This paring down process can relate to both physical and mental clutter that may have built up in our lives. On the physical side, perhaps we pare down our belongings and rethink our approach to possessions. We replace what we think we need with what we actually need. Maybe this all means we need less living space and frees up some funds for other life adventures. On the mental side, we let go of needing to be in all places at once. We let go of chasing busy. We reduce our commitments. We reduce our stress. An essential life skill we need to develop as part of this paring down process is the ability to say no and push back occasionally. This isn’t always easy. Saying no and turning down opportunities feels counter-intuitive for many of us. We really struggle with this. We don’t want to let others down, or make them feel bad. We don’t want to miss out on experiences. However, to protect our time and energy for the areas of our lives that we have identified as mattering most to us, this ability is also a necessity. We must make a choice and some of those choices might not be easy. Ironically, we must show restraint to free ourselves up. This may be sobering news but it can also be empowering. We can make peace with the fact that saying no doesn’t mean we’re letting others down, or being a bad person. We can let go of feeling like we are missing out because we know that actually, by saying no, we are making space for the things that matter most. We are focusing. Many positives can come from this approach but an important, and perhaps underestimated, one is that we get the white space in our lives back. White space is the part of our days that is unplanned. A time to down tools and relax. A time for the outside world, with all its demands, distractions and stressors, to melt away temporarily. It’s where we hit pause, time to reflect, to ponder or just to rest up. It is yin, to yang’s action. This time is necessary but so often suffers at the hands of us being in motion. When was the last time you just were? No staring at a smartphone or screen. Just time to be. Maybe with a warm beverage in hand looking out of the window. Maybe just looking up at the white of the ceiling. Letting the problems and challenges of the day just float away for a while. In an age of distraction attraction and general busyness, this time for white space becomes ever more necessary to our wellbeing. Full speed ahead only lasts so long. We have to make time to rest occasionally. We must be kind to ourselves. Simplicity can be an antidote to the modern feelings of busyness and overwhelm so many of us feel. We can pare down, reduce distractions and focus on the essential. We can simplify. Carl writes short books full of big ideas. He is also the proud owner of Frictionless Living which is focused on helping readers live simpler, finding focus and clarity in distracted times.